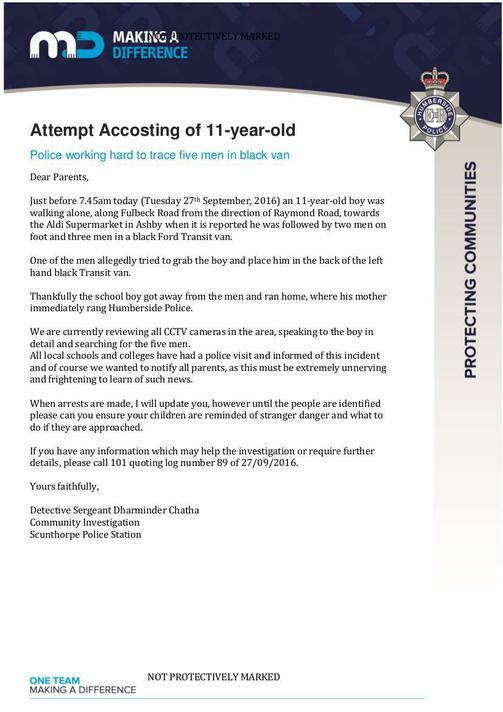 Just before 7.45am today (Tuesday 27th September, 2016) an 11-year-old boy was walking alone, along Fulbeck Road from the direction of Raymond Road, towards the Aldi Supermarket in Ashby when it is reported he was followed by two men on foot and three men in a black Ford Transit van. One of the men allegedly tried to grab the boy and place him in the back of the left hand black Transit van. Thankfully the school boy got away from the men and ran home, where his mother immediately rang Humberside Police. We are currently reviewing all CCTV cameras in the area, speaking to the boy in detail and searching for the five men. All local schools and colleges have had a police visit and informed of this incident and of course we wanted to notify all parents, as this must be extremely unnerving and frightening to learn of such news. When arrests are made, I will update you, however until the people are identified please can you ensure your children are reminded of stranger danger and what to do if they are approached. If you have any information which may help the investigation or require further details, please call 101 quoting log number 89 of 27/09/2016.